Since I wasn’t home to cook this past week, this week will feature a double serving starting with my first foray into swiss chard. My intention is to give green kohlrabi a try next. We’ll see how that goes. Using a large frying pan, set chopped onions to brown. 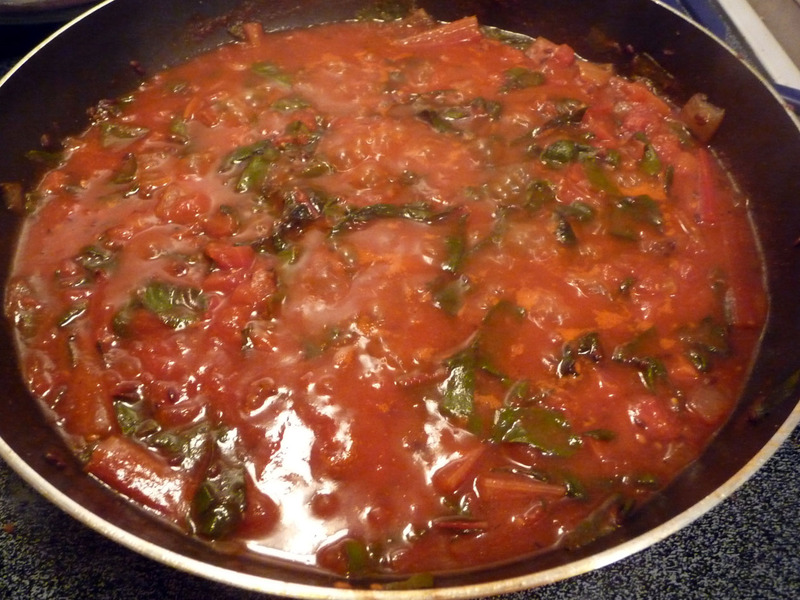 Once those are started place swiss chard in a saucepan with just enough water to be even with their level. Bring to a boil and cook for 3 minutes. Pour contents of the saucepan into the frying pan with the onions (being careful not to splash yourself). Add tomatoes & canned tomato sauce or paste. Mix together along a dash of clove, salt, fresh ground pepper and a tsp or so of garlic. Simmer for 10-15 minutes. I made my sauce the night before and refrigerated it to give the flavors more time to mingle, but you can also just proceed. Partially cook your spaghetti noodles. I boiled them for about 5 minutes to be a little on the hard side of al dente, but I don’t like my noodles too soft. 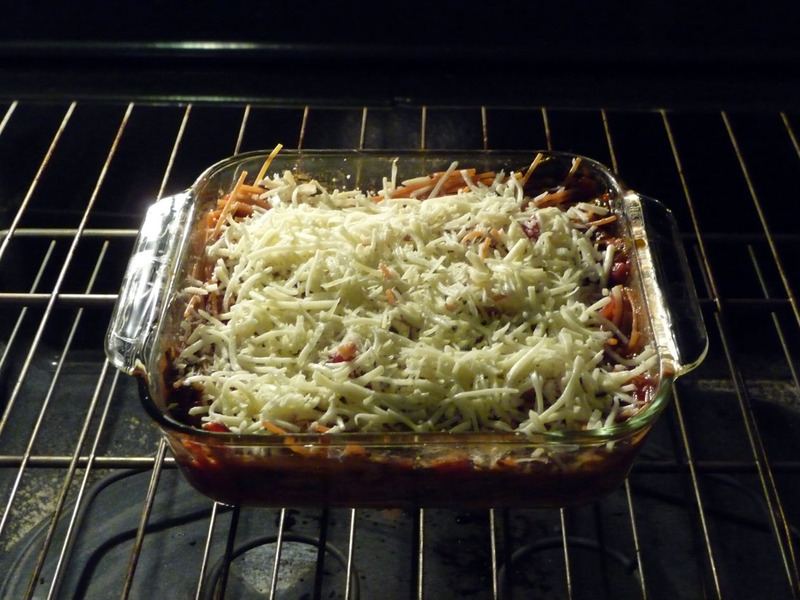 Drain noodles and pour into an 8×8 pan along with sauce. Mix together well and top with shredded cheese. Bake at 375 for 1/2 an hour or until cheese is beginning to brown. This looks unbelievably good. 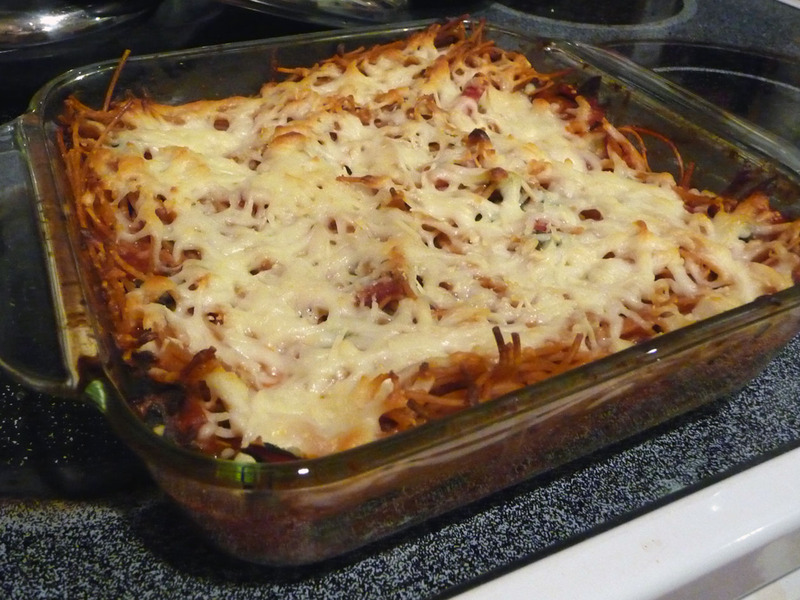 I’m a big fan of Swiss chard, and I have been wanting to make baked pasta for a long time. I’ll keep this recipe in mind once it cools down to the point where I can actually turn on my oven.